So… that’s totally a lie. Running through spider webs is the one part of Fall that I absolutely dread and I am guaranteed to run through a few before winter sets in. The joyful experience usually goes something like this…. Up at o-dark thirty… find some running clothes, dig through gym bag or purse to find my iPod, get a few things situated and head out the door. Hit Play on the iPod, get my Runkeeper app going on my phone and start off with a slow, dreadful pace and wonder how I will get through all the miles ahead of me. At this point I am on high spiderweb alert with eyes strained looking for any faint glimmer of light reflecting on a web. After a few miles I usually find my groove, tune into my music, zone out of reality, and then bam… face first into a web and instant karate chopping, skin crawling, and sprinting all occur at the same time. Why… why, why, why does my face always come in contact first???? Long after a run is over and I’ve taken a shower and made it to work I still suffer from the creep crawlies. Should a hair graze my shoulder or a piece of lint touch my arm, I will jump as if the spider had been hiding all day, waiting for the perfect opportunity in the day to jump out and freak me out one more time. Ugh. On the less creep crawly side…. there are a few things I do love about Fall. I love running in the cooler temps. I love that Fall marks the beginning of marathon training for me. I love hunting for the perfect pumpkins and having a family fun carving day. I love Black Friday shopping (even though I almost never make it out to shop). I love seeing the seasons change and the way the leaves fall when the wind blows. With over 35 years of a running background running in the fall was also my favorite time of year to run. Love this post and run on! Ha! 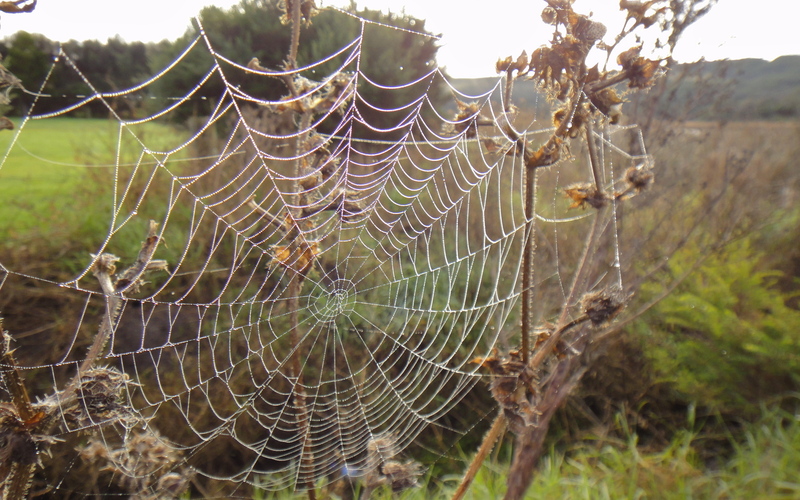 Yes, spiders (and their over abundance during this time of year) is definitely a negative. Great post! Thanks Kim! When I walked out the door this morning…. spider. Thanks for stopping by, reading, and taking the time to reply. 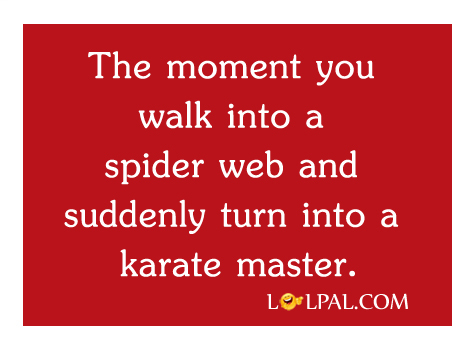 I’m sure I’ve given plenty of drivers a laugh when they see me karate chop through a spiderweb totally grossed out! Hahahaha you cracked me up! I was like “She likes running through spider webs?? Is she crazy? !” There is a spider web next to my friend’s front door, a “garden spider” it’s called. I do actually love watching it. It’s a really pretty spider and it doesn’t mess with anybody. I like looking at them from afar! They’re so interesting!